I actually don’t miss the length (at least not yet). This is the first time in my life that I’ve had short hair (except when I was 2, before my hair actually grew in). I think I took off more than I originally planned, but I don’t think I took off anything unnecessary. I think if I use a lot of gel, my hair can go into a ponytail. My only concern now is styling. How did I know where to cut? Easy! 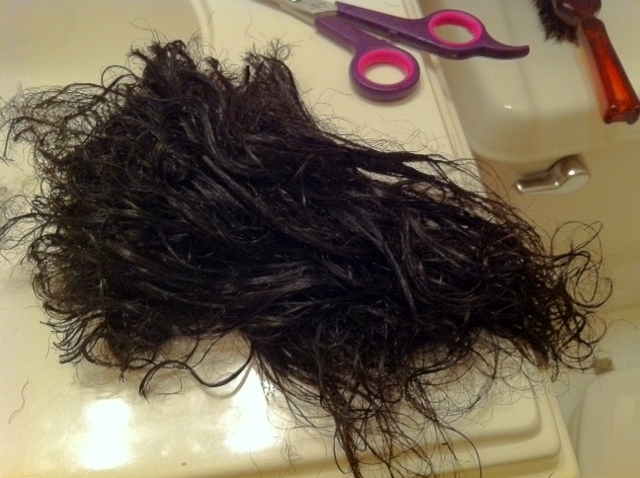 This is when I first cut all of the relaxed ends off. I kinda like this look better than the “styled” look. I originally planned to take off 3-4 inches, but it looks like I took off more than that from some areas. As far as donating goes, I don’t think my hair meets the 10″ requirement for donation. Besides… I think I’ll keep my ponytial… in a ziplock bag. Don’t judge me. …and here’s my styled hair. Eh, not my favorite style. 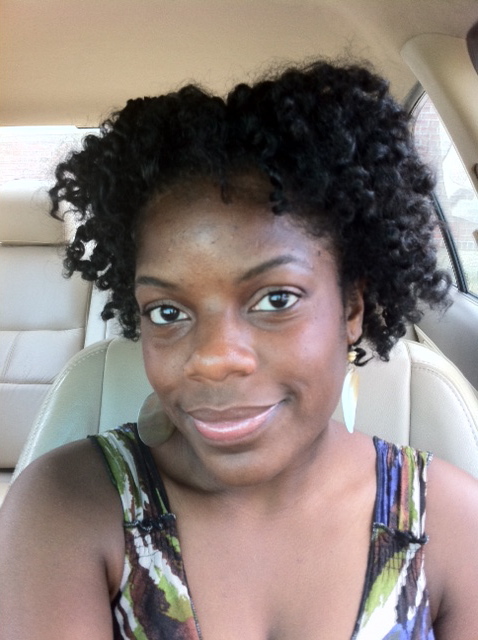 I did small twists to achieve this look. The curls on the right side of my head are still much tighter than the left side. So now when you guys say that it takes time for you hair to adjust, what exactly do you mean? You look great!! I’m a year post now and about to cut it in two weeks. I wish I could have lasted as long as you did to get more length but I’m just ready to be rid of those ends. Idk what ppl mean by adjusting but I guess it is a big difference to go from straight, sometimes long hair to curly, shrunken, textured, sometimes short hair. 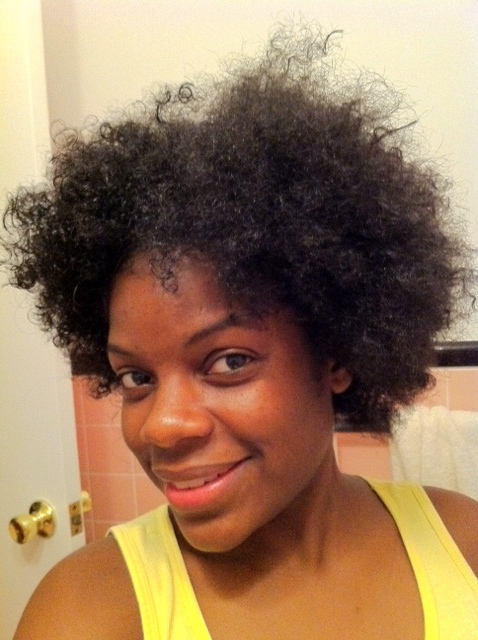 The styles you were use to trying on your relaxed and transitioning hair may look different on your natural hair. Yes, I think that no matter how long you wait to cut it off, it’s always going to feel like it’s not long enough only because you’re losing length that you were used to. 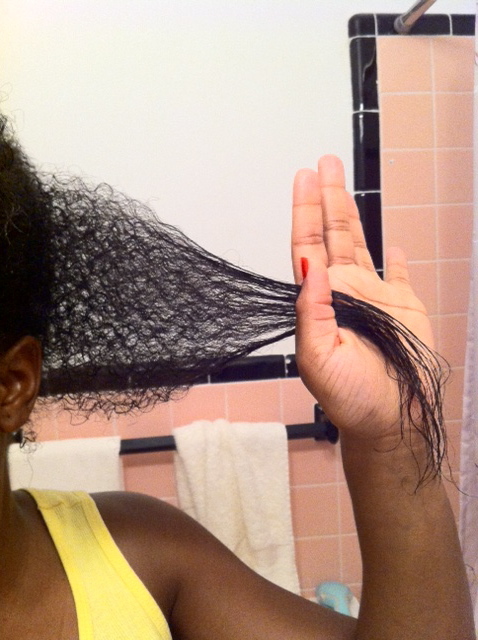 The shrinkage factor is crazy! I took that into consideration before I cut, but it’s really something! Good luck to you with your cut. I’d love to see pics. wow you did it! I wasn’t sure if you’d change your mind. It’s good you don’t miss the hair. I’ll bet that it will grow back quickly. I am soooo the same way about not punking out when I say I’m going to do something! Once I verbalize it, it’s like I feel that I must do it! It’s like how you said you didn’t tell anyone you were going natural, because you felt that if you changed your mind and had said it, you couldn’t back out! That’s how I ended up doing my first bodybuilding competition!! I was contemplating it, but was scared. I told my very close cousin that I was thinking about it, but don’t tell anyone. He told. Then, I felt I had to do it! And, I did! LOL!! Anywho, the real reason I came on here to comment is to bring your attention back to this twist out and compare it to your twist out now. Do you see what we meant about your hair being in “shock” after the cut? It looks really different now and it’s only a month later, right? It’s not that your hair looks bad … but I think it tends to be bushier and not as curly in that first couple of weeks or so after the BC.